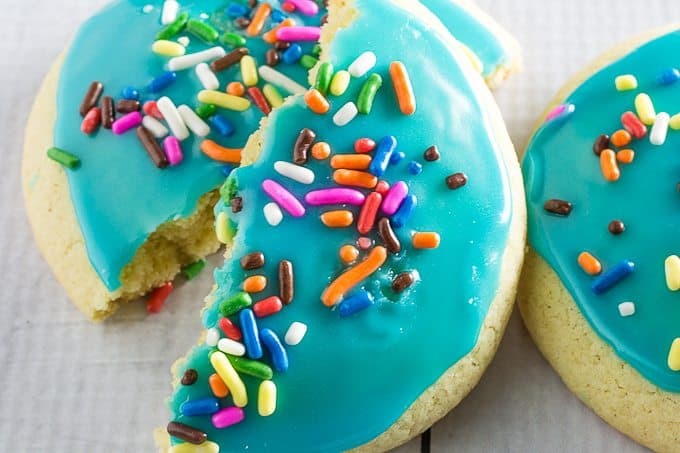 Gluten Free Sugar Cookies take a traditional cookie recipe and add colorful icing and fun toppings. You can make these for just about any holiday. 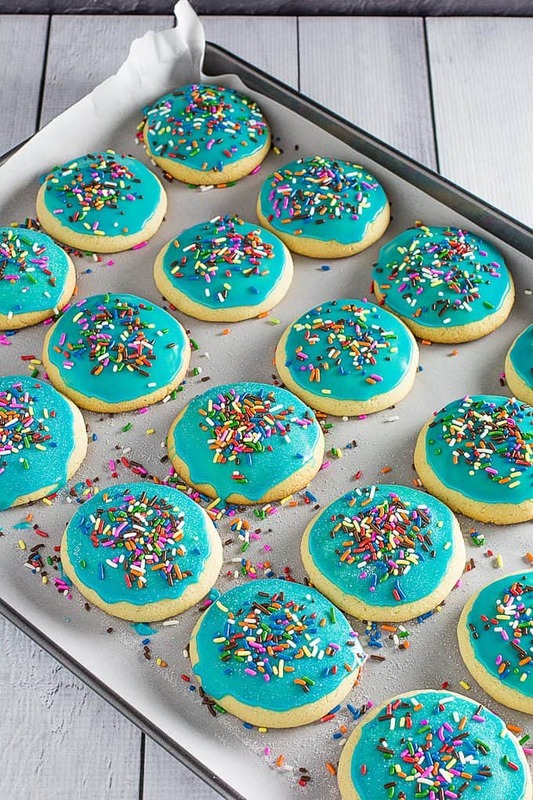 They’re so easy to bake, and fun to decorate with the whole family! Here’s an old classic cookie recipe, just in time for Christmas Eve! 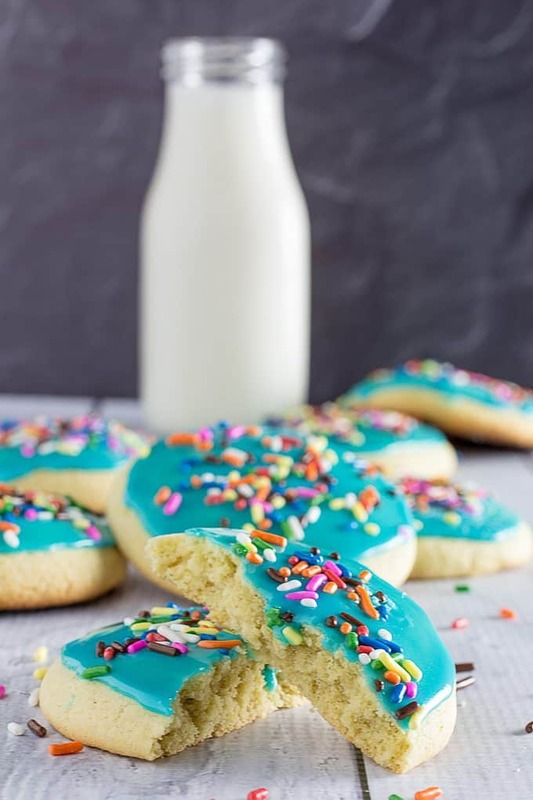 Gluten Free Sugar Cookies are the most simple cookie you can make, and have a great buttery-sweet flavor to them. Best of all is the frosting, which you can make in any color you’d like, and decorate for the holidays. They’re a fantastic way to bring the family together, and enjoy a sweet treat! 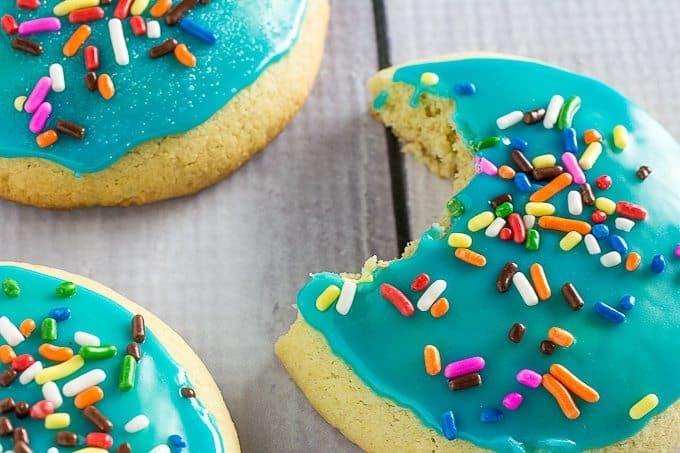 One of the things I love most about these cookies is that you can decorate them just about any way you want. The icing is really simple, I whipped it up in about 2 minutes, tops, using a small bowl and a fork. I added a few drops of blue food coloring to make this nice light blue color. I started with three drops, and then just added a little bit more at a time until I achieved the shade I was looking for. Which is something that reminded me of the movie Frozen, which I may or may not have been watching at the time. Well, it’s my birthday! Hooray! And this year Andrew and I decided to take up archery. So I’m spending the day eating these festive gluten free sugar cookies, and taking an archery lesson at the range near our home. Then my parents are flying into town, and we’re all going to our favorite seafood restaurant on the bay. I think the older I get, the more I enjoy my birthday. Because the older I get, the more I appreciate spending time with my family. And special occasions like holidays and birthdays are the perfect time to bring everyone together. Which is also one of my favorite things about these gluten free sugar cookies. I love making up a big batch of these and getting everyone around the table to decorate them together. I’ll make a few different colors of icing, and get a few different toppings like sprinkles, chocolate chips, or nuts. 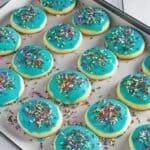 Did I mention how easy these gluten free sugar cookies are to make? Because they are probably the most simple of the holiday cookies. Even more so than my gluten free chocolate chip cookies, and that’s saying a lot! This batch will make up about 24 cookies, depending on how big you scoop them. Pro Tip: Use a medium to small-sized ice cream scoop, roll them into a ball, and flatten them in the palm of your hands. That will give you the perfect shape for each cookie! So get creative, gather the family around, and start decorating these tasty things! 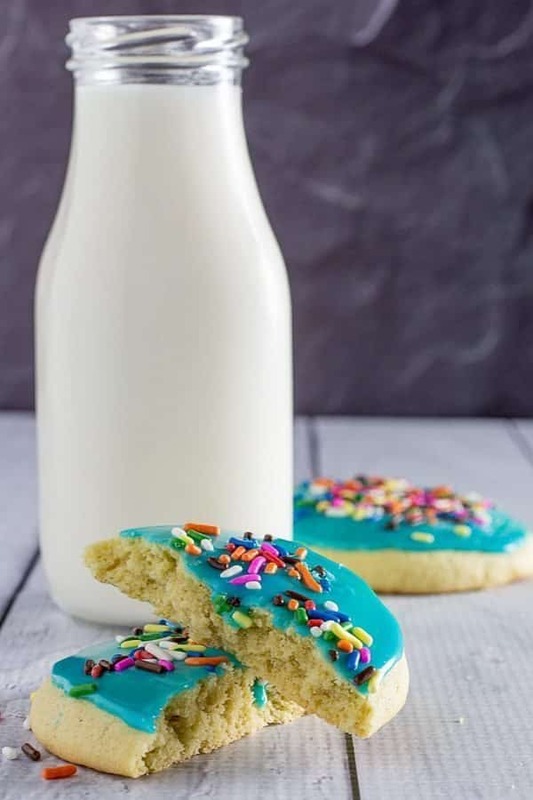 Gluten Free Sugar Cookies take a traditional cookie recipe and add colorful icing and fun toppings. You can make these for just about any holiday. They're so easy to bake, and fun to decorate with the whole family! In a bowl, cream together butter, shortening, and sugar. Mix in vanilla extract and then eggs until just blended. Mix dry ingredients with wet ingredients until well combined. Make small 1-2 inch balls of dough in your hand, flatten about half way, and place on baking sheet. Bake 8-10 minutes, or until cookies are just starting to brown. Whisk all ingredients together until well mixed. Use on cooled cookies. 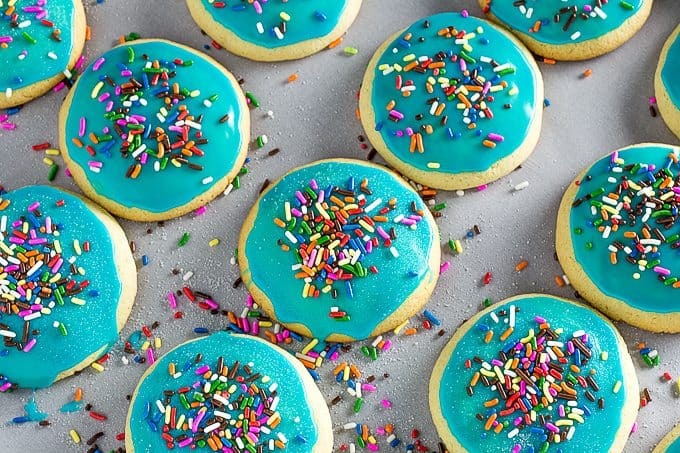 Use an ice cream scoop to make each cookie uniform in size.